If you’re considering gutter replacement for your home or business in Edgewood, New Mexico, or another nearby area, don’t hesitate. Gutters that aren’t functioning correctly can lead to a variety of problems that can be expensive to fix, including landscape erosion, roof rot, and more. Thankfully, ABC Seamless of Albuquerque has served the area as a professional gutter company since 1989, so we understand all of these problems and know how to prevent them. 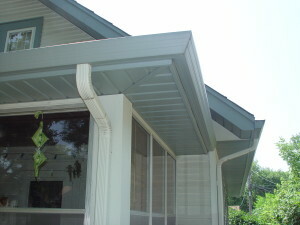 We provide durable gutters that are precisely measured and fabricated on-site before being installed. This construction style ensures that your new gutters will fit the exact dimensions of your home and will be entirely seamless, meaning they will never break, crack, or leak unlike traditional pre-cut gutters which are generally more susceptible to such issues. Aesthetics – Our seamless rain gutters are sure to blend in with your home’s soffit and fascia system because there are many colors and styles to choose from. Minimal maintenance – Our gutters are essentially maintenance free, ensuring that no painting will ever be required. Additionally, as part of a gutter replacement project, ABC Seamless of Albuquerque can install gutter guards to help protect your new rain gutters from leaves, twigs, and other debris that can build up and cause costly damage to your home due to overflowing water. When you are ready to schedule your gutter replacement project in Edgewood, NM, or a surrounding area, call ABC Seamless of Albuquerque today.